Get tips from the experts! Follow along as Betsy Hughes, Track Shack co-owner takes you through the foam rolling basics. Do your shoelaces come untied during exercise? 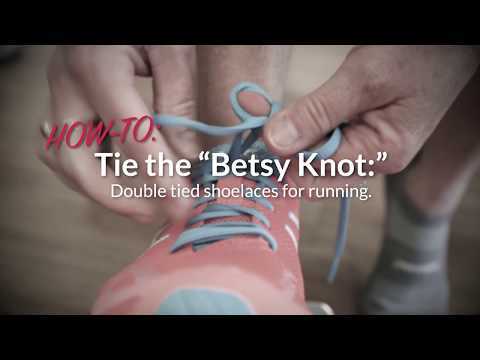 View and share the Betsy Knot, a tying technique that's easy for runners, walkers and shoe-tiers of all ages! Great news, the process is similar to other Forerunner watches. Who do you know that needs help with their running tech? Our experts in store are always ready to help. Get Started! Here's how to set up your Garmin Forerunner. Great news, the set up process is similar to other Forerunner watches. Track Shack co-owner and running shoe guru, Betsy Hughes, helps three half marathon competitors with the finer points of running shoe care and maintenance. Starts at 0:21. Track Shack co-owner and running shoe guru, Betsy Hughes, shares her expert advice on the best running apparel for women. Starts at 0:21. Compression Leg Sleeves help runners to increase circulation, providing muscles with more of the oxygenated blood they need to recover sooner.